Carolina head athletic trainer Ryan Vermillion said there is no timetable for his return. Williams was hurt during the team's third day of training camp practice and its first in pads. He was injured on a non-contact play, according to the team's official website. "Daryl is a solid young man, and he's a big part of what we do,'' Panthers coach Ron Rivera said. The 6-foot-6, 330-pound Williams was dropping back into pass protection when he crumpled to the ground, screaming in pain. His teammates took a knee as the training staff attended to Williams. Williams' knee was in a brace as he was carted off the field. "It got real quiet and it just kind of hits you in the stomach," defensive end Wes Horton told the Charlotte Observer. He's such a good kid and we're all praying for him. He'll bounce back. But I think Taylor (Moton) will do a great job stepping up." Potential replacements for Williams would be Moton, a second-round draft pick in 2017. The Panthers also brought in Jeremiah Sirles as a free agent. [post_ads]Williams, a fourth-round selection of the Panthers in the 2015 NFL Draft, started all 16 games in 2017 and was named a second-team Pro Bowl selection. He started 10 of 13 games in 2016. --New England Patriots quarterback Tom Brady met with reporters Saturday but cut short the session when a question involved his personal trainer. Brady brushed aside one question about a reported rift with coach Bill Belichick that surfaced last season and continued to make headlines when he failed to participate in voluntary offseason workouts for the first time since 2010. "I have no thoughts," the three-time NFL Most Valuable Player responded when questioned about the repeated rumors of turmoil within the organization. One reason cited for the reported tension between Brady and Belichick was when the coach banned Alex Guerrero -- Brady's personal trainer -- from New England's team facilities and the sidelines last season. Among the New England players who work with Guerrero is wide receiver Julian Edelman, who in June was suspended four games for violating the NFL's performance-enhancing substances policy. Asked his reaction to how some observers linked Edelman's suspension to working with Guerrero, Brady abruptly shut the media session down. "I have no comment. That's just ridiculous. I'm out," Brady said. 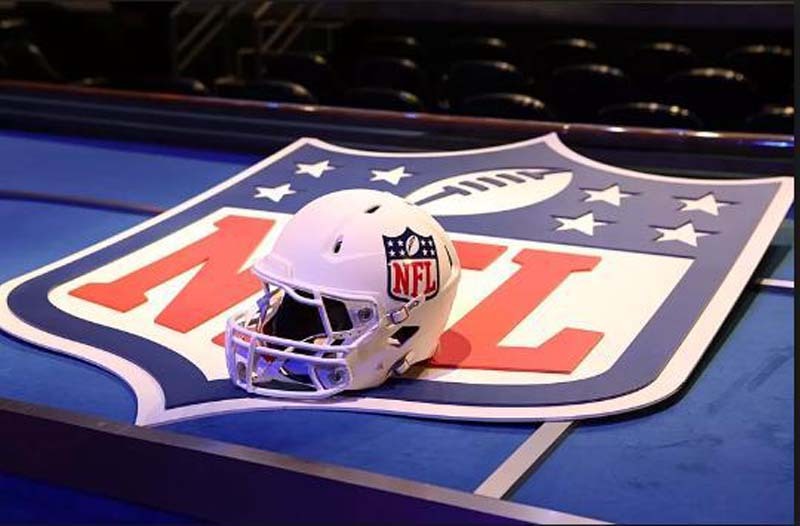 --The holdup in reaching a contract agreement between the Chicago Bears and first-round draft pick Roquan Smith appears to be the NFL's new rule on players lowering their helmets on tackles, multiple news outlets reported Saturday. Bears coach Matt Nagy referred to the helmet rule as "part of the issue" while speaking with the media at training camp on Saturday. The Bears are preparing for their first preseason action on Thursday against the Baltimore Ravens in the Hall of Fame Game in Canton, Ohio. Smith and his agent are reported to want financial protections in his contract in the event of a suspension for a helmet-related hit during the regular season. Smith wants to make sure his guaranteed money could be reclaimed after a suspension under the new rule, but the Bears are reported to be reluctant about this type of protection. --New England Patriots wide receiver Julian Edelman is taking the blame for his four-game suspension for a positive drug test, he said Saturday at the team's training camp in Foxborough, Mass. Edelman received the four-game suspension in June for violating the NFL's policy on performance-enhancing substances. His appeal was rejected and he'll miss the first month of the regular season. The veteran is allowed to participate in training camp but won't be eligible for reinstatement during the regular season until Week 5. Edelman refused to identify the substance involved in the positive test. "It's disappointing with the penalty and the findings, and you know, I'm definitely accountable for that." --With second-year running back Elijah McGuire sidelined indefinitely after suffering a foot fracture Friday during the first training camp practice, the New York Jets brought in free agents Alfred Morris and Orleans Darkwa for workouts Saturday. The 24-year-old McGuire might need surgery to repair the fracture. Jets coach Todd Bowles was uncertain whether the team will sign a replacement for McGuire or if he will be placed on short-term injured reserve. "I'm sure it's tough for him going into his second year," Bowles said. "Any time somebody gets hurt, it's a tough break, but he's a hard worker and we expect him to be back as soon as he's ready." Morris rushed for 155 yards and one touchdown but averaged 4.8 yards per carry in 2017. Darkwa compiled 1,038 rushing yards and nine rushing touchdowns with the Giants. In 2017, he carried 171 times for 751 yards, a 4.4-yard average, and five touchdowns. --Washington Redskins rookie defensive tackle Da'Ron Payne is expected to miss 2-to-3 weeks with an ankle injury, multiple media outlets reported. Payne, Washington's first-round pick (No. 13 overall) in the 2018 NFL Draft, was hurt during Friday's practice when a teammate stepped on his ankle. Redskins coach Jay Gruden said Payne, who was the first first-round pick in this year's draft to agree to contract terms, is expected to be in a walking boot for one week. --Cleveland Browns offensive tackle Greg Robinson was carted off the field Friday on the first practice of training camp. No definitive injury was offered by the team for Robinson, who was signed last month to compete for the starting left tackle position. There were conflicting media reports as to Robinson's injury, with his head and leg cited as issues. Robinson, the No. 2 overall pick by the Rams in the 2014 NFL Draft, started six games for the Detroit Lions in 2017 before injuring his ankle in mid-October. He was placed on injured reserve and waived with an injury designation. Robinson, 25, served as a starter with the Rams for three years and played 46 games before being traded to the Lions for a sixth-round pick. --Cincinnati Bengals rookie offensive guard Rod Taylor was lost for the season with a knee injury. Taylor was hurt during the first day of training camp Thursday and the injury was diagnosed as a torn ACL the following day, the Cincinnati Enquirer reported. Taylor, a seventh-round pick out of the University of Mississippi in the 2018 NFL Draft, Taylor had to be carted off the field after falling to the ground and grabbing his right knee. --The Seattle Seahawks reached agreement with left tackle Duane Brown on a three-year, $36.5 million contract extension, multiple media outlets reported Saturday. Brown appeared to confirm the deal with a tweet Saturday afternoon that said: "Looking forward to playing the rest of my career here!" The 6-foot-4, 320-pound Brown was acquired last year by the Seahawks in a trade with the Houston Texans along with a fifth-round draft pick for a second-round pick in 2018 and a third-round selection in 2018. Brown would have been entering the final year of his contract worth $9.75 million in 2018. The new deal extends the longevity of his contract through the 2021 season. --The Oakland Raiders are expected to sign offensive lineman Oday Aboushi, multiple media outlets reported Saturday. Aboushi has familiarity with new Raiders offensive line coach Tom Cable. He started eight games for the Seattle Seahawks last season while Cable was in charge of the offensive line. Aboushi, a fifth-round pick of the New York Jets in 2013, has appeared in 34 games (26 starts) in four seasons with the Jets, Houston Texans and Seahawks. Aboushi has played both guard position but he was used solely on the ride side with Seattle. He provides depth after Oakland lineman Vadal Alexander was a no-show for training camp. --Ryan Shazier was on the field with the Pittsburgh Steelers on Friday, walking with a cane as the team's linebackers went through drills. Shazier, who will not play this season after suffering a career-threating spinal injury last December, walked with a limp in a Twitter video posting by ESPN's Jeremy Fowler. The 25-year-old Shazier has made steady progress from the injury. He had to undergo spinal stabilization surgery two days after he was hurt in a game against the Cincinnati Bengals on Dec. 4. --Atlanta Falcons rookie wide receiver Calvin Ridley suffered a leg injury during Saturday's practice, multiple media outlets reported. Falcons coach Dan Quinn told reporters that Ridley hurt either a knee or hamstring, per the Atlanta Journal-Constitution. Quinn initially said he thought Ridley had to leave practice due to a heat-related issue and added that his status will be updated Sunday. Ridley, the first-round pick of the Falcons (No. 26 overall), was considered the most pro-ready receiver in this year's college class. Ridley became the last Atlanta rookie to sign with the club, agreeing to a four-year deal earlier this month that was worth a reported $10.9 million over four years. --The Minnesota Vikings will move forward after the sudden death of Tony Sparano this week with co-offensive line coaches as his replacement. Coach Mike Zimmer announced Saturday -- one day after the team attended Sparano's funeral -- that Clancy Barone and Andrew Janocko will be responsible for working with offensive linemen during the 2018 season. Both coaches have experience with the position group. Barone served as the Vikings' tight ends coach last season and previously was offensive line coach with the Denver Broncos when they won Super Bowl 50. Janocko was Minnesota's assistant offensive line coach under Sparano in 2017.